Ask the Mamas: Sun Safety Mama Say What?! | Mama Say What?! My toddler can’t wait to get outside! Can you recommend any specific products, tips, or tricks to help keep my daughter safe in the sun this summer? Hats with DRAW STRINGS for the wee ones. ~Angie W.
This is not a necessity, but I have a pair of these Speedo toddler water shoes and they are excellent for when my daughter is running around in the yard playing with a sprinkler or wading in the public kiddie pool. They give her some grip on the slippery pool bottom and protect her feet from sticks, rocks and bugs in the yard. And they don’t get waterlogged. ~Christina D.
A good hat that they will actually keep on their head, a solid pair of shoes, and good sunscreen! 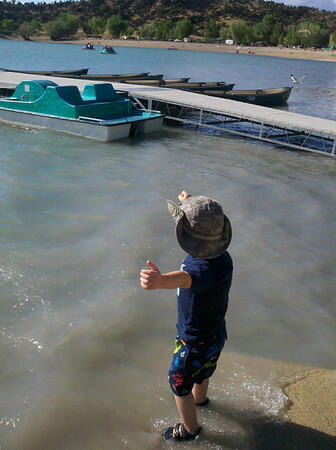 The last thing you want is for your little one to get a bad sunburn. ~Kathy S.
Like it’s been mentioned already, a great hat is so important to keep their little faces protected from the sun. I am very grateful that my son actually keeps his hat on now. Whenever we’re going to be playing outside for an extended length of time, we wear sunscreen too. Our current favorite that doesn’t also cost an arm and a leg is Coppertone’s Water Babies Pure & Free. I like that it’s free of most of the toxic chemicals present in a lot of sunscreens these days, but also doesn’t leave my son’s skin all white. We have to work a bit to get it rubbed in, but the peace of mind is totally worth it. Staying hydrated is also very important. We bring a water bottle outside with us everywhere we go, even if we’re just playing in the backyard. When it’s especially hot (well into the 90s and 100s) then we have to limit the amount of time we spend outside to 30 minutes to an hour. Thankfully, my son doesn’t argue with me when I say it’s time to come in and cool off. 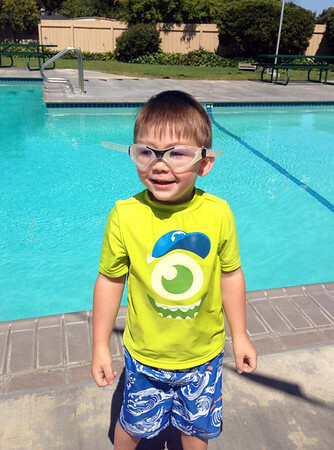 ~Alex T.
We got our kiddos rash guards (the t-shirt style swimsuits) to help keep their shoulders from getting sun burnt on especially sunny days that they’re outside in the pool or playing with the water table. We always make sure to keep sunscreen on hand too – the kind that is sweat and water resistant. In addition to the obvious spots, make sure to apply it to all the weird spots— ears, feet, hands, exposed scalp —they burn too! And hats —if they’ll wear em, that is! Drawstrings definitely help. Oh, and my daughter doesn’t go anywhere without her “shades” —definitely keeps her little eyes safe though! And don’t forget to keep them hydrated, and don’t stay out for long periods of time if it’s too hot out. ~Sam A. 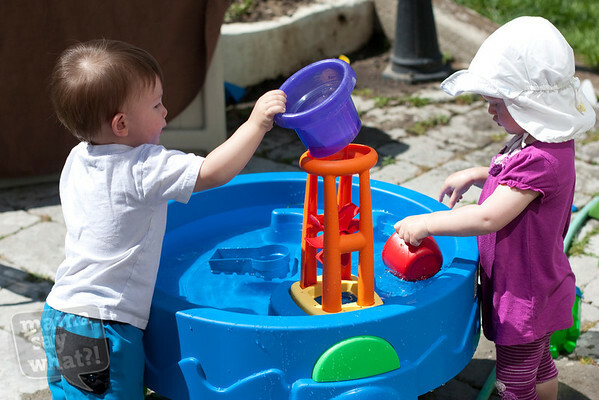 Play outside in the morning instead of the heat of the afternoon. The misters they are selling now are awesome for cooling in the backyard. ~Sue F.
I have the same advice as many of the other ladies: a hat (with a tie! ), sunscreen, sunglasses etc. 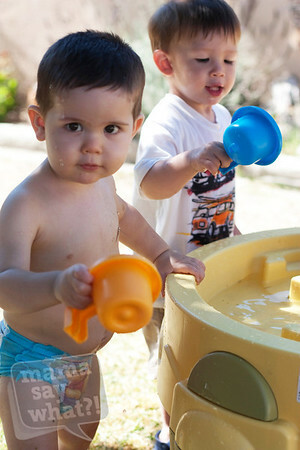 I try to put my kids in light, breathable clothing that still protects their skin from the sun. We also try to go to the parks that have a water play area as well so when my toddler gets warm she can go splash in the water for a bit and then go back to playing on the playground. We also keep a full bottle of water in the diaper bag when we go out of the house because she always amazes me with how much she can drink. ~Cassie W.
Sunscreen! Get a good, kid-safe one, preferably zinc oxide and reapply as needed. We try not to be out in the sun for more than an hour or so at a time — by then she’s ready to come cool down inside for a bit anyway. Avoid being outside from 10 a.m. to 2 p.m., when the sun’s rays tend to be strongest, if you can (and that tends to coincide at least somewhat with nap time, so yay!). ~Lauren W.
We use Aveeno Baby sunscreen which has been great! It’s pretty thick but covers really well. We also make sure to use a hat if we will be out for more than 30 minutes or so. We love spending time outdoors so we make sure to always bring plenty of water to drink and a good pair of sandals that strap in the back! ~Corey P.
Added by Corey P. on July 9, 2013. One of the things that really worked with our son (because he didn’t like to wear his hat prior to this) was at his 18 mo. appointment we asked his pediatrician what to do about sun protection and she told him that he has to wear a hat and glasses. Now every time he takes off his hat or glasses outside, we say “remember what the doctor said?” and he says “hat, glass” and puts them back on Sometimes getting someone who they don’t see everyday to tell them things helps set that memory, at least it did for us! Thanks so much for all the wonderful tips! Rash guard, brimmed hat and Aveeno baby sunblock! My LO has sensitive skin so Aveeno works perfect for us! Great info! We live in sunny Fl I’ll be putting these tips to good use.